AB JEWELS at NIGHT GOLF indeed it was. At the AB Jewels Night golf it seemed like the stars came down from the skies and sparkled the bunker sands which were highlighted by the glow sticks. The flying coloured balls in red, blue and green looked as if it was a meteor shower. Golfers wore glow hats and from a distance it looked like a set from a walt dizney movie. Just concluded AB Jewels Night Golf tournament Kensville has left participants in awe as each and every one of them claim to have never experienced such an enthralling and an exciting golf event ever. 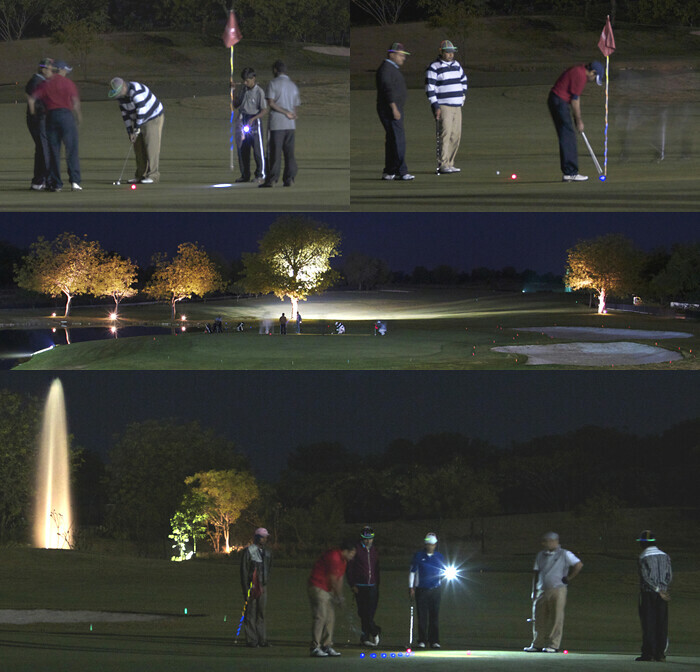 TAEGA ( The Ahmedabad Elite Golfers Association) went all out to produce one of the most unique and a never done before night golf tournament. AB Jewels Night Golf saw a full house participation of 45 golfers. The event was played over 9 holes on stable ford scoring format. There were 5 teams with 9 a sid & each team had a lady golfer at the helm as the captain. Mrs Shradha Hattangadi Mehta who had the honor of being the captain of her team. After the round of night golf there was a the UTTERRIKIE chipping competition.. uttirrikie is a sound made by golfers on the course when someone swings and misses the ball.. as the name suggests players were not allowed to take any practice swings.. they had to just walk to the ball and quickly chip it and get it as close to the hole as possible and the winner and runners up here were Anand Dave & Shreekant Goenka respectively.. Finally even the golfers with a bad day were rewarded with the Emerald Gardners Delight Prize and the winner and runners up here were Abhay Mangaldas & Purav Shah AB Jewels night golf concluded with a lucky draw and left everyone mesmerized by the glittering glow sticks that shined all over the golf course.